Jack Hatch, the only Democrat running for governor, has started interviewing candidates to decide who he’ll choose as a running mate. Hatch, a long-time legislator, is a real estate developer. Iowa’s constitution was changed more than two decades ago, so candidates for governor and lieutenant governor run together as a team, just like the president and vice president. Iowa has had a female lieutenant governor since January of 1987. 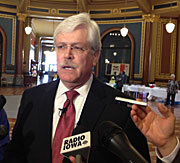 Hatch said while he is “embarrassed” Iowa has not elected a woman as a governor, a U.S. Senator or to congress, he doesn’t feel pressure to choose a woman as a running mate. Hatch does say he needs to look outside of his home territory in Des Moines for a running mate. Hatch has sought the advice of the past two Democratic governors as well as previous Democratic nominees who went through this process of choosing a running mate. Delegates at the Iowa Democratic Party’s convention on June 21 will be asked to ratify Hatch’s decision. “And we hope to announce, to give the delegates a chance to assess my choice for lieutenant governor,” Hatch said. The last independently-elected lieutenant governor in Iowa was Jo Ann Zimmerman, who won in 1986 for a job that used to include serving as president of the state senate. The next lieutenant governor was Joy Corning, elected as Terry Branstad’s running mate in 1990 and 1994. Sally Pederson was Tom Vilsack’s lieutenant governor running mate in 1998 and 2002. In 2006, Patty Judge ended her own campaign to be governor and agreed to be Chet Culver’s lieutenant governor. In 2010, Terry Branstad chose Kim Reynolds as his running mate.